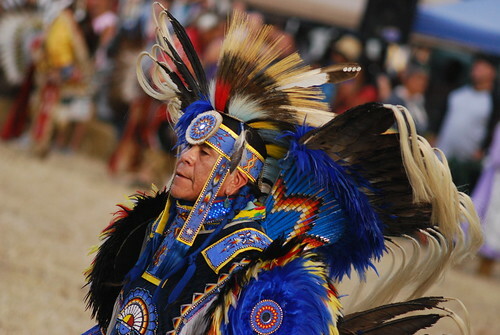 Another year, another Pow Wow. 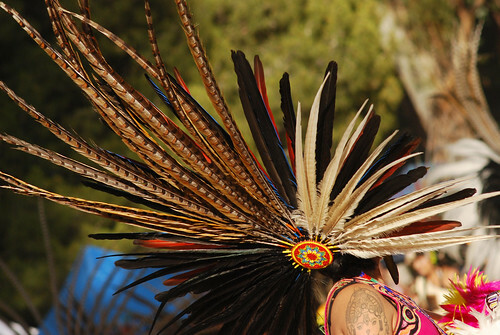 Time for fry bread, drums, and dancing. In the sprit of my human zoo post, I’m not just going to present photos without comment. 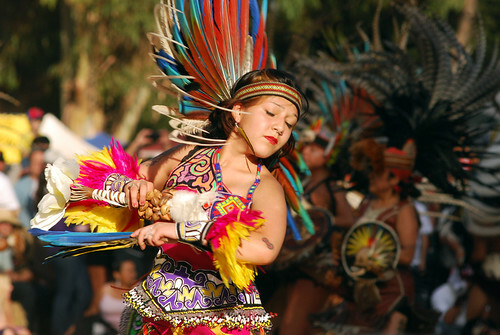 Most of the photos are of the Aztec Dancers—actually a local group called Calpulli Tonalehqueh who I grew up watching at the Santa Clara County fair as well as at the Stanford Pow Wow. 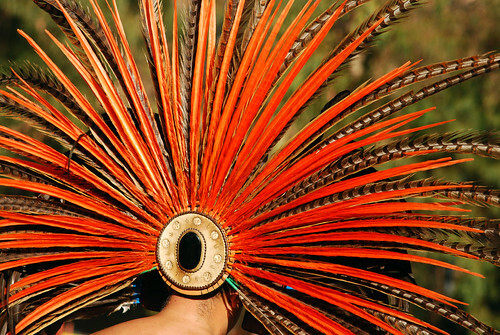 On a smaller scale where only a handful of dancers perform, the Aztec dances act out various myths. 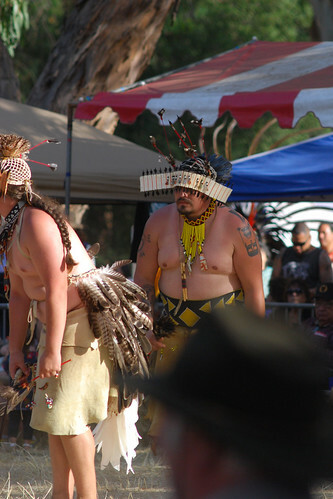 The huge troop dance here though serves more as entertainment during meal times than as part of the Pow Wow proper. Which is why I tend to see them every year since a large portion of my Pow Wow experience is based on getting an Indian taco for dinner. 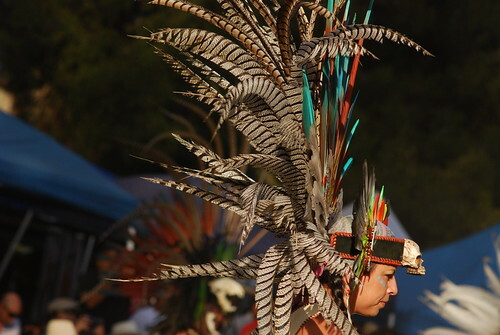 Also, from a photography point of view, the Aztec regalia is consistently the most photogenic (in a flashy OMG colors and feathers and movement way) and they perform during the best time of day for taking photos. Some years there are other special performances. 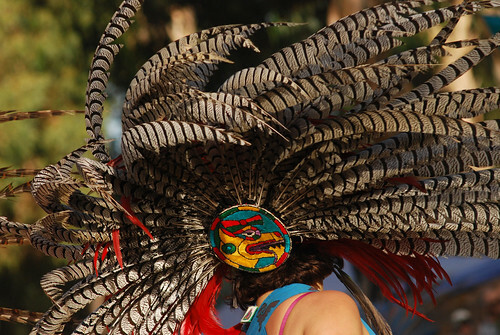 * This year was one such year as we were treated to Miwok dancing. 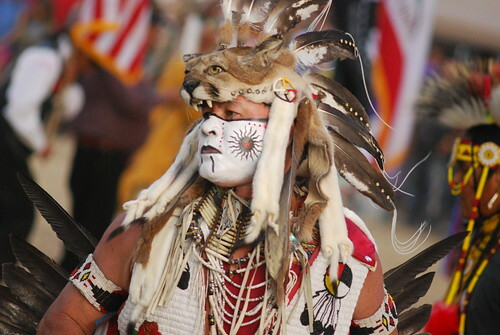 Much of the pow wow dancing is tribe-generic (though of plains-based origen) so it’s especially nice to see the tribe-specific forms and support the people who have been preserving these traditions. 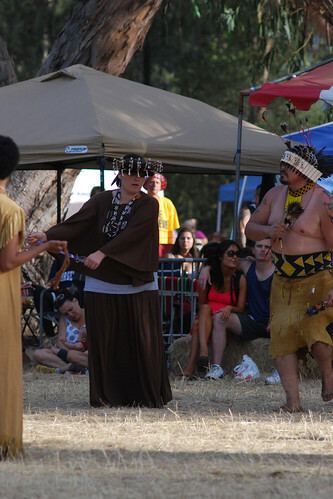 The Miwok are sort of the big local tribe but I’ve never seen any of their dancing before. 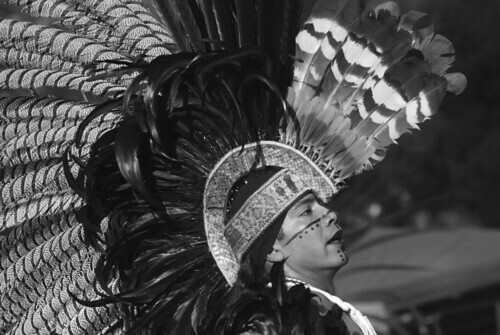 *The top image in my previous post is of the Tlingit Raven Dance. It was exceedingly cool to watch. Gene Tagoban is quite the performer and storyteller. I was busy eating during much of their performance so I can’t fully describe everything. 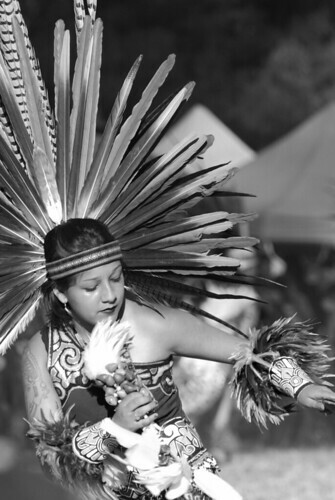 But it’s notable how their regalia covers their eyes to signify the state of being the dancers are in while dancing. And I should note that I’m not quite comfortable using the word “performance” when describing their dances since the dancing still felt like a small, private event. I also caught some of the grand entry before the light started to fail. It’s always nice to see all the different regalia. It’s also fun to see some of the same people year after year and notice what they’ve added to and changed. One of these days when the kids are older, we’ll stay longer and watch the competitions again. One other note. 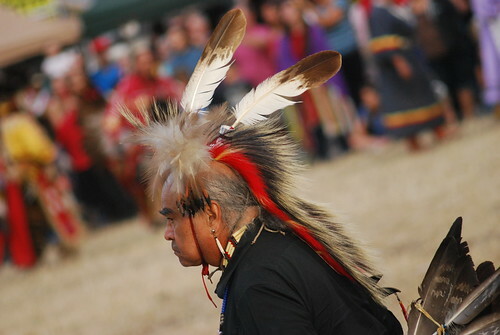 Every year it seems I receive a flickr message or two from someone I photographed at the pow wow asking for a copy of the photo I took of them. I always send them a copy of my original. It’s funny, even though it’s a small thing, it makes me feel as if I’m participating in it.